Chronic infection following total hip arthroplasty: Any role for ilizarov? Recent Advances have reduced the risk of infection in total hip arthroplasty (THA), but increased volumes of these surgeries could create a large burden of infection with significant functional and economic hardships. Surgical treatment of this problem has witnessed a changing paradigm over the years in search of ideal options. Stability of the implants, duration and severity of infection, antibiotic sensitivity of microorganisms and comorbidities help choose the right treatment. In case of failure to preserve or revise the implanted hip, salvage surgeries such as resection arthroplasty and arthrodesis are useful. 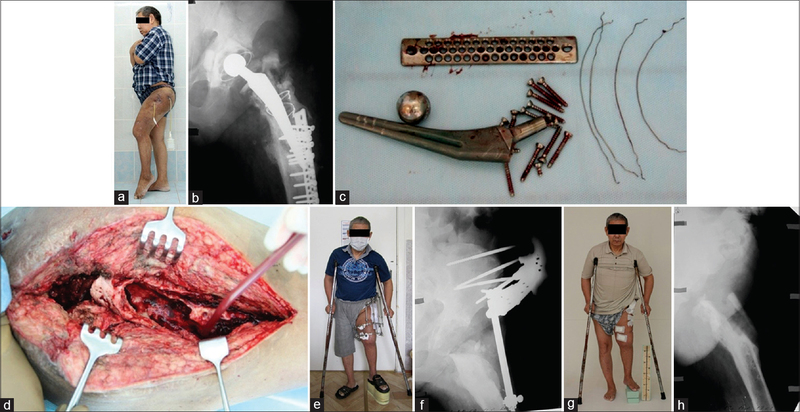 We have previously reported on Ilizarov-assisted resection arthroplasty and arthrodesis as salvage for chronic severe postarthroplasty infection of the hip. We further examine the role of Ilizarov in patients who have two-stage revision of the infected prostheses. Two stage revision protocols with temporary antibiotic spacers have reported spacer dislocation rates as high as 42%, adding to morbidity and compromised results. Functional results of resection arthroplasty alone are inferior because of instability and shortening. Overall, instability in all these can lead to pain and recurrence of infection. We assumed that addition of Ilizarov external fixator for short periods will fill these gaps in the conventional treatment protocols. Gubin has proved tension stress of the Ilizarov apparatus promotes a bactericidal effect in tissues because of activation of biosynthetic processes and reduces the need for systemic antibiotics. Ours is a center with long-standing expertise in Ilizarov technique. Our protocol for treating chronic periprosthetic infection following THA was hip arthrodesis or resection arthroplasty, both performed with help of ilizarov fixator till 2003. From 2004 we are performing a two-stage revision arthroplasty or a modified resection arthroplasty using the Ilizarov method in some patients. We explain the indications for using the Ilizarov in the following sections. This study has two objectives: (1) To study the clinical, radiological, and functional result of this approach, and (2) to examine our experience of the role of Ilizarov method in this difficult treatment. We retrospectively reviewed a consecutive series of 73 patients with chronic periprosthetic infection after total hip replacement (presentation with more than 4 weeks of symptoms), who underwent surgical treatment according to our institutional protocol (explained as below) between January 2004 and December 2014. They were all unilateral cases with infection diagnosed according to the AAOS consensus guidelines. After Institutional Review Board approval, we included all patients who had a minimum of 1-year follow-up in the study. Minimum follow-up and complete data were available for all patients. After thorough history, clinical examination, radiological and laboratory assessment, patients had surgery for thorough debridement and all prostheses removed. We started antibiotic therapy preoperatively, guided by culture samples from sinus or by joint aspiration without sinus. We assessed patients for the extent of bone and soft-tissue destruction after debridement. We chose Ilizarov-assisted resection arthroplasty when all of these were present: 1) femoral defect of grade 3 or 4 according to Krishnamurthy, 2) acetabular defect of grade 2 or 3 according to Paprosky, 3) three or more previous surgeries to the hip joint, 4) presence of polymicrobial infection, and 5) diabetes mellitus. By itself, severe immunodeficiency or severe soft tissue destruction also needed resection arthroplasty. We offered all other patients a two-stage revision arthroplasty with insertion of a temporary antibiotic spacer. Patient preference (preoperative counseling) also played a role in this decision-making. All patients were operated in lateral decubitus position. We injected all sinuses tracks with brilliant cresyl green to completely identify them at surgery. We excised all active sinuses meticulously. We used the Hardinge approach in all hips. We performed a thorough debridement and sent samples of joint fluid, soft tissue, and bone pieces for microbiological analysis. All implanted components and cement were removed. For a two-stage revision, we inserted a commercially available lyophilized gentamicin-impregnated collagen implant into the femoral medullary canal and acetabular defects. We inserted a commercially available, properly sized, gentamicin-impregnated spacer into the femoral canal to reduce the joint. If spacer was unstable in surgery, the wound was closed in layers over two suction drains; the patient turned supine and a nonarticulated Ilizarov external fixator assembled with hip fixed in 10-20° of abduction. The assembly consisted of four to five half pins into the iliac wing attached to an arch and two rings attached to middle and lower third of femur with two and three tensioned wires, respectively [Figure 1]a,[Figure 1]b,[Figure 1]c,[Figure 1]d,[Figure 1]e,[Figure 1]f.
When we performed an Ilizarov -assisted resection arthroplasty, we packed the medullary canal and wound with antiseptic-soaked gauze pieces and closed the wound temporarily after debridement. We assembled the Ilizarov apparatus as in resection group, but added hinges at the hip. We removed temporary sutures and gauze pieces, refreshed the proximal end of the femur and inserted it into the acetabulum, or under its upper edge in case of an inferior acetabular defect. We fixed the Hip in 10-20° of abduction and closed the wound over two suction drains [Figure 2]a,[Figure 2]b,[Figure 2]c,[Figure 2]d,[Figure 2]e,[Figure 2]f. Also, we inserted an intramedullary drain and removed it through a hole in the diaphysis of the femur. Among the 73 patients, 43 (58.9%) underwent two-stage revision and 30 (41.1%) underwent Ilizarov-assisted resection arthroplasty. Nine patients who could have had a revision according to our criteria had a resection, and two patients who were candidates for resection had a revision because of their preference. The revision group had a subset of eight patients who had stabilization of antibiotics pacer with Ilizarov fixator because of intraoperative instability. We performed revision arthroplasties using both cemented and uncemented prostheses, based on clinical presentation. Suction drains were removed between 3rd and 4th postoperative day and sutures removed at 2 weeks. Intravenous antibiotics were given for a minimum of 3 weeks as per se nsitivity reports and prolonged if necessary. Prophylaxis for deep vein thrombosis administered initially by subcutaneous injection of low-molecular-weight heparin followed by oral Rivaroxaban for a total period of 5 weeks. We removed suction drains between 3rd and 4th postoperative day and sutures at 2 weeks. We gave intravenous antibiotics for a minimum of 3 weeks or longer if needed as by sensitivity reports. We gave subcutaneous injection of low-molecular-weight heparin for prophylaxis of deep vein thrombosis at first and followed it by oral Rivaroxaban for 5 weeks. All patients, irrespective of the presence of fixator had a supervised rehab program and were taught to progressively weight bear to tolerance. We compensated any shortening with shoe raises. In cases of spacers stabilized with external fixator, the apparatus was retained for 4 to 6 weeks depending on intraoperative assessment of stability [Figure 1]g and [Figure 1]h. Reimplantation was done for them between 4 and 9 months after complete clearance of infection [Figure 1]i and [Figure 1]j. We taught them to bear weight to tolerance with a support meanwhile. Their weight bearing ability and gait after removal of Ilizarov fixator were comparable to that of those with stable spacers as fixator had promoted good soft-tissue healing and stability. In the resection group, we first fixed the proximal femur rigidly in the acetabulum for 4-5 weeks till full weight bearing was possible. Later, we loosened the hinges for active and passive joint exercises, and allowed partial weight bearing during 2 weeks until frame removal. We mobilized the patient with a brace and crutches for 2 months and allowed progress to independent walking as tolerated [Figure 2]g and [Figure 2]h. We offered the choice of limb lengthening to patients with significant shortening after resection arthroplasty at a second-stage. We followed up all patients after discharge from the hospital at monthly intervals for the 1st year, every 3 months for the next 2 years, and yearly after that. We performed clinical examination and radiological and laboratory investigations as needed. We assessed hip function using Harris Hip Score (HHS). Data was prospectively maintained. We retrieved and analyzed data from medical records, radiographs, and clinical photographs. We expressed normally distributed continuous data as mean ± standard deviations. We expressed proportions as percentages. The Small sample size precluded a meaningful statistical analysis. Thus, we present descriptive data for intuitive clinical interpretation. We summarize patient details in [Table 1]. Twenty-two patients (30%) had some surgical intervention in the hip before the index arthroplasty, and 12 (16.4%) had history of infection of the hip before index arthroplasty. These patients had an average of 4.2 ± 2.6 previous surgeries to the hip (including surgeries for underlying pathology, index arthroplasty, revision if any, and debridements), of which 1.5 ± 1.7 were for infection before approaching us. Clinical finding at presentation is summarized in [Table 2]. The mean preoperative HHS was 43.2 ± 18.7. Three patients (4.1%) each had excellent and good function, five (6.9%) had satisfactory function; and remaining 62 patients (84.9%) had unsatisfactory function. Shortening was noted in 35 patients (47.9%) which was <3 cm in 22, between 3 and 5 cm in seven and more than 5 cm in six patients. Fifteen patients (20.5%) had reduced range of motion (ROM) of knee and two patients (2.7%) had no movement at the knee. Radiographs showed evidence of loosening of components as given in [Table 3]. Intraoperative assessment revealed bone defects distributed across Paprosky types as in [Table 4]. Microbiological assessment of samples yielded growth of Gram-positive organisms in 35 patients (47.9%), Gram-negative organisms in 4 (5.5%), polymicrobial growth in 33 (45.2%), and no growth in 1 (1.4%) patient. Among these, 19 patients (26%) grew methicillin-resistant Staphylococcus spp. and three patients (4.1%) grew extended-spectrum β-lactamase producing Gram-negative organisms. The mean duration of hospital stay was 47 ± 15.9 days for patients of the revision group and 83 ± 6.2 days for patients of resection group. In the revision group, two patients with spacers without external fixator dislocated the spacer. They were reduced under anesthesia, one patient was given a derotation boot for 4 weeks, and the other was given abduction orthosis for 6 weeks based direction of instability. Both refused supplementation with Ilizarov and so could not walk. None of the eight patients with Ilizarov supplementation of spacer developed hip instability at any stage. One patient of the resection group subluxed his proximal femur from under the acetabulum. We performed closed reduction and realignment of the apparatus under anesthesia. None of the patients in the resection group had increase of shortening or proximal migration of trochanter radiologically after removal of fixator implying formation of a stable pseudarthrosis. Four patients (5.5%) had wound dehiscence that needed secondary suturing. Fifteen patients with Ilizarov apparatus developed pin-tract infection. Most of them settled with regular dressings and oral antibiotics, however, six of them needed exchange of pins/Schanz screws under anesthesia. In the revision group, seven patients (16.3%) had an early relapse of the infection. They underwent debridement without exchange of spacer and subsequently a successful revision arthroplasty. Eight patients of the revision group (18.7%) had a late relapse while they were on spacers; three of them underwent debridement with exchange of spacer and eventually successful revision arthroplasty. In three patients, infection was uncontrolled and we offered them Ilizarov-assisted resection arthroplasty. In two patients, we did not intervene surgically due to poor general condition and put them on long-term oral antibiotic suppression. In resection group, 17 and two patients had early and late relapse, respectively. All patients with early relapse underwent debridement with continuation of external fixator. Among the two patients with late infection, one was with previous pin tracts. Both patients underwent debridement. All infections settled with these measures. Thus, the success of infection eradication was in 68 out of 73 patients (93.2%). About functional results, most of our patients in the revision group had no signs of pain, joint contractures, or shortening. Most of them did not need support and could walk for long distances. Four patients had shortening, limping, and restricted ambulation. The average HHS of this group was 81.4 ± 9 (preoperative 46.7 ± 22.3). In resection group, pain of varying severity was present in 21 patients (70%); 29 (96.6%) had limping; and 28 of them (93.3%) were using support for ambulation. Shortening of the operated limb by 3 to 7 cm resulted in 27 (90%) patients, 3 (10%) patients had more than 10 cm of shortening, but they had larger limb length discrepancy to start with. One patient of the resection group with 10 cm of shortening accepted the option of limb lengthening and we could successfully lengthen her by 7 cm at the distal femur. The average score of the resection group was 52.6 ± 11.8 (preoperative 38.3 ± 23.1). Overall, the mean HHS improved from the preoperative value of 43.3 ± 18.8 to 67 ± 10.4. 12 (16.4%) patients had excellent function, 19 (26%) had good, 13 (17.9%) had satisfactory, and 29 (39.7%) had unsatisfactory outcome. Chronic periprosthetic infections of the hip result in substantial morbidity and mortality, and results of treatment are poor in the elderly. Early mobilization is very important as most of these patients are elderly. It is here that we think the role of Ilizarov external fixation is important. Till date, there are few reports exploring the role of Ilizarov in compromised total hip replacement.,,, Our treatment algorithm and results are summarized in [Figure 3]. Instability and dislocation of the temporary antibiotic spacer is common and seriously affects the rehabilitation of the patient (pain, sciatic nerve injury, inability to weight bear, and repeat surgeries). Intraoperative assessment of stability and Ilizarov stabilization of unstable hips is an effective measure to prevent this. Any dislocation can always be treated by applying an Ilizarov Fixator, which allows mobilization. Brief period of such immobilization in our experience ensures good soft-tissue healing giving good stability of the spacer and subsequently of the final prosthesis. Though the gold standard approach of two-stage revision claims good results of eradication of infection, recent reports question this claim., Most of the reports assess the outcome of cases who had successful exchange of spacer to permanent prosthesis. Many patients do not have the second part of reimplantation for a variety of reasons. They may also require a second spacer exchange surgery. Obviously two-stage revision has high rates of failure to control infection and mortality. We believe this high rate of mortality is because of the poor rehabilitation in the interim period. The success rates of two-stage revision will come down if we account the patients who do not go for the second stage and those who die in the interim period. With our protocol, all low-demand patients (who potentially could have failed with two-stage revision) are treated by Ilizarov-assisted resection arthroplasty allowing early mobilization, low mortality, and reasonable function. Pelvic support osteotomy is a good choice as a second procedure for patients with resection arthroplasty to improve the function. However, reconstruction can be done only as the second-stage after resolution of infection and improvement of bone quality. It does not eliminate the morbidity and mortality associated with resection arthroplasty. A Valgus osteotomy of proximal femur is needed to give pelvic stability but it causes further shortening and malalignment. To compensate we perform distal femur devalgisation and lengthening osteotomy. This adds to the duration spent in Ilizarov fixator which may not be feasible for the elderly subset of patients of infected total hip replacement. Our modification of resection arthroplasty addresses all these issues (none of our patients underwent pelvic support osteotomy). Pelvic support osteotomy gives stability and improved function, but at a high cost of time which the elderly cannot afford. The fixator is applied on same day as resection and stays only for 6-7 weeks. By this time, strong fibrous pseudarthrosis forms between the proximal femur and acetabulum. In conventional resection arthroplasty, the proximal femoral ends do not rest in the acetabulum but in the scar tissue formed. Therefore, the patients cannot bear full weight on the hip after treatment, and shortening can progress due to the migration of the femoral end or fibrous scar rupture that both provoke pain and infection recurrence. Our method overcomes these limitations and promotes early mobilization. Furthermore, it allows reasonable range of motion in the hip in all planes, which is sufficient for most low-demand patients. Ilizarov fixator differs from conventional external fixators in many ways. Ilizarov has parts which allow us a customized assembly depending on the weight of the patient, status of bone, and rehabilitation goals. Circumferential stability offered by femoral rings and trampoline effect by tensioned wires help physiological loading of the hip joint. The precisely assembled Ilizarov fixator allows mobilization without risk of subluxation or dislocation. This study has numerous limitations. First, the study was retrospective from hospital records. Even though our protocol categorized patients into revision and resection groups, we could not adhere to it in 11 patients due to their preference. This definitely could have led to selection bias. Since surgeons themselves recorded the follow-up, assessment bias is likely. Objective scores for patient satisfaction could have enriched the study but was not addressed due to nonavailability of data. Ilizarov has a supportive role in chronic periprosthetic infections of the hip by adding stability and ensuring early mobilization of the patient. We strongly recommend Ilizarov supplementation of temporary antibiotic spacers with intraoperative instability. When revision arthroplasty is not possible, Ilizarov-assisted resection arthroplasty will ensure faster rehabilitation, a stable pseudarthrosis and better function. The brief period of wearing the Ilizarov may be cumbersome but any pin infections do not cause harm in the long term. Lamagni T. Epidemiology and burden of prosthetic joint infections. J Antimicrob Chemother 2014;69 Suppl 1:5-10. Jiranek WA, Waligora AC, Hess SR, Golladay GL. Surgical treatment of prosthetic joint infections of the hip and knee: Changing paradigms? J Arthroplasty 2015;30:912-8. De Man FH, Sendi P, Zimmerli W, Maurer TB, Ochsner PE, Ilchmann T, et al. Infectiological, functional, and radiographic outcome after revision for prosthetic hip infection according to a strict algorithm. Acta Orthop 2011;82:27-34. Cordero-Ampuero J. Girdlestone procedure: When and why. Hip Int 2012;22 Suppl 8:S36-9. Beaulé PE, Matta JM, Mast JW. Hip arthrodesis: Current indications and techniques. J Am Acad Orthop Surg 2002;10:249-58. Kliushin NM, Ababkov YV, Ermakov AM, Malkova TA. Modified girdlestone arthroplasty and hip arthrodesis using the ilizarov external fixator as a salvage method in the management of severely infected total hip replacement. Indian J Orthop 2016;50:16-24. Drexler M, Kuzyk PR, Koo K, Gross AE, Kosashvili Y, Reischl N, et al. The use of a supra-acetabular antibiotic-loaded cement shelf to improve hip stability in first-stage infected total hip arthroplasty. J Arthroplasty 2016;31:2574-8. Molfetta L, Bassetti M, Benvenuti M, Caldo D. Analysis of clinical data in patients with Girdlestone arthroplasty: A new score. Hip Int 2007;17:170-5. Parvizi J, Zmistowski B, Berbari EF, Bauer TW, Springer BD, Della Valle CJ, et al. New definition for periprosthetic joint infection: From the workgroup of the musculoskeletal infection society. Clin Orthop Relat Res 2011;469:2992-4. Krishnamurthy AB, MacDonald SJ, Paprosky WG. 5- to 13-year follow-up study on cementless femoral components in revision surgery. J Arthroplasty 1997;12:839-47. Paprosky WG, Perona PG, Lawrence JM. Acetabular defect classification and surgical reconstruction in revision arthroplasty. A 6-year follow-up evaluation. J Arthroplasty 1994;9:33-44. Tsukayama DT, Estrada R, Gustilo RB. Infection after total hip arthroplasty. A study of the treatment of one hundred and six infections. J Bone Joint Surg Am 1996;78:512-23. Giulieri SG, Graber P, Ochsner PE, Zimmerli W. Management of infection associated with total hip arthroplasty according to a treatment algorithm. Infection 2004;32:222-8. Brinker MR, Mathews V, O'Connor DP. Ilizarov distraction before revision hip arthroplasty after resection arthroplasty with profound limb shortening. J Arthroplasty 2009;24:826.e17-23. Sakai T, Ohzono K, Nakase T, Lee SB, Manaka T, Nishihara S, et al. Treatment of periprosthetic femoral fracture after cementless total hip arthroplasty with ilizarov external fixation. J Arthroplasty 2007;22:617-20. Emara KM. Pelvic support osteotomy in the treatment of patients with excision arthroplasty. Clin Orthop Relat Res 2008;466:708-13. Gomez MM, Tan TL, Manrique J, Deirmengian GK, Parvizi J. The fate of spacers in the treatment of periprosthetic joint infection. J Bone Joint Surg Am 2015;97:1495-502. Blumenfeld TJ. 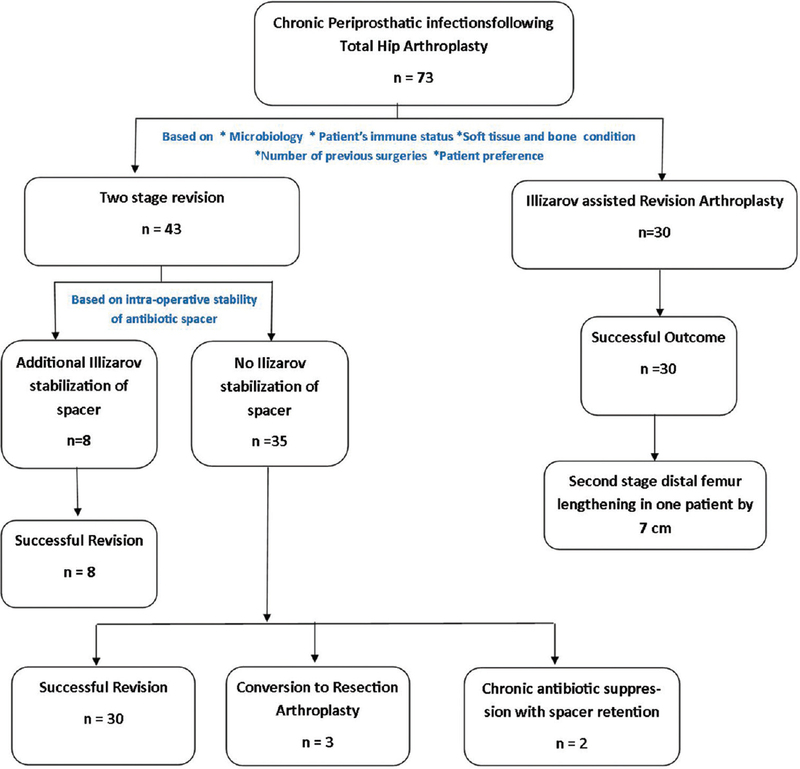 Rethinking the definition of success in the management of a periprosthetic joint infection: Commentary on an article by Miguel M. Gomez, MD, et al. The fate of spacers in the treatment of periprosthetic joint infection. J Bone Joint Surg Am 2015;97:e64. Berend KR, Lombardi AV Jr., Morris MJ, Bergeson AG, Adams JB, Sneller MA, et al. Two-stage treatment of hip periprosthetic joint infection is associated with a high rate of infection control but high mortality. Clin Orthop Relat Res 2013;471:510-8. Malcolm TL, Gad BV, Elsharkawy KA, Higuera CA. Complication, survival, and reoperation rates following girdlestone resection arthroplasty. 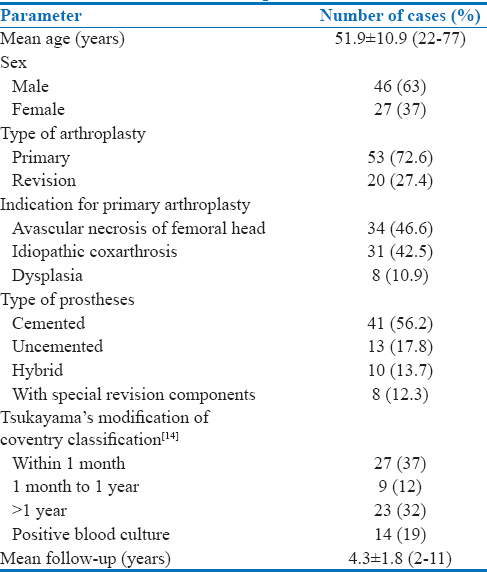 J Arthroplasty 2015;30:1183-6. Sharma H, Dreghorn CR, Gardner ER. Girdlestone resection arthroplasty of the hip: Current perspectives. Curr Orthop 2005;19:385-92.